A Marine Engine's Carbon Footprint. How to make your boat engine eco-friendly. There's no question direct-injected outboards, four-stroke outboards and common rail diesels leave a softer imprint on the environment than do classic marine engines. In time, the boating world will entirely switch over entirely to the new hardware. Older, inefficient conventional two-strokes will wear out and only EPA-certified motors will be available. But for now at least, junking a perfectly good engine would be shamefully wasteful. That's for the simple reason there are plenty of enviro-friendly steps boaters can take while using older marine engines. First and foremost, take special care when topping off the fuel tanks. When gasoline spills, about 60 percent of the rainbow slick evaporates into the atmosphere, joining the multitude of other toxins in the air we breathe. The remaining 40 percent dirties the water wreaking havoc on the aquatic plants and animals. Be advised that spilling even a single drop of gasoline or diesel fuel on the water can land you in big trouble with the U.S. Coast Guard. Under current law, all gasoline spills or motor oil spills must be reported, and in extreme circumstances a boater can be fined or jailed. This harsh mandate includes not only fuel overflow, but also the inadvertent pumping overboard of contaminated bilge water. Do it and you are guilty. Salvation is found by, simply paying attention to what you're doing. At the fuel dock, instead of gaping at the gorgeous scenery, pay attention to what you're doing. Another worthy strategy: retrofit the boat's fuel system with a Racor Lifeguard Fuel-Air Separator, a standard item on many new boats. Most fuel spills happen when a big bubble of air trapped in the fuel fill line causes a burp, regurgitating a slug of fuel back up the inlet, out onto the covering board and over the sides into the water. 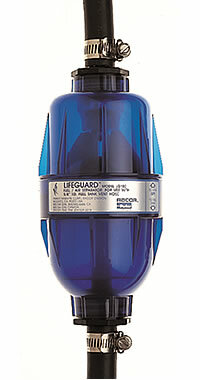 Lifeguard's one-way valve automatically purges trapped air so gas reflux doesn't occur. A backup measure is to use of Enviro-Marine's Spill Stop, which includes a splash ring that surrounds the fuel nozzle, backed up by an absorbent pillow with adhesive strips that attach to the transom. Should gasoline burble, splash back is neatly absorbed by the ring and nozzle. Truth be told, you could make your own using a handful of fuel absorbent sheets. There's also Davis Instruments' No-Spill fuel recovery bottle that fits over the air vent. Should a spill occur, canned cures, consisting of oil- and fuel-absorbent crystals and powders are available at most marine supply stores. Best bet is to have one on board. Savvy dock masters strategically place emergency kits near the fuel hoses to correct the bad deeds of their fuel boys. Three noteworthy brands include: 3M, Petrol Rem and Spill Stop. Simply cast a few handfuls of powder onto the water, or deploy a bag or sausage filled with powder or crystals. The powder's active ingredient absorbs and encapsulates the petroleum molecules. 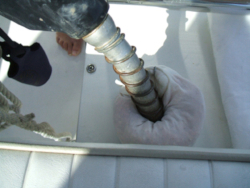 A variation on this theme are the bilge blankets and socks that are more typically thrown into the bilge to absorb engine oil. They're good for about a year. 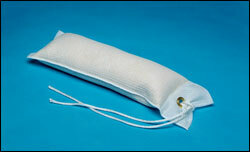 Petrol Rem's BioSok, a 9.5 inch- long fabric sock, stuffed like a sausage with a half-pound of active ingredient that absorbs about a pound (nearly a quart) of petroleum. Not only does BioSok absorb oil from bilge water, but its microbes also consume and biodegrade the oil. Because the oil is bio-remediated, there is no secondary contaminant to deal with Jargon Buster Bio-remediation is the use of microorganism metabolism to absorb pollutants such as hydrocarbons and convert them into non-toxic substances. For outboard owners who want to minimize impact on the environment, there's a heroic step they can take: Use biodegradable TCW-3 oil. Biodegradable oil lubricates the reciprocating mass, exhausts through the propeller hub and in a matter of weeks reverts into its natural, non-toxic elements. Admittedly biodegradable TCW-3 is alot more expensive than either petroleum or synthetic blends. Do-it-yourselfers can also get involved in the good fight by properly disposing of dead batteries, spent crankcase and gear oil, out-of-date antifreeze and stale gasoline. All these things are toxic waste and the most efficient way to dispose of them is to work with a boatyard. Most yards work closely with the EPA. Also know that whenever buying a new starting or deep-cycle battery the purveyor will most often take the dead one, and sometimes even pay a few dollars for it. Print and internet Yellow Pages list lubricant re-cyclers, who usually charge a few pennies per gallon to haul away spent crankcase and lower unit oil. Don't make the mistake of needlessly idling dockside waiting for the engine to warm-up. That's because marine engines (outboards and inboards) are inefficient at idle, wasting fuel and polluting the air and water. It's only common sense to minimize engine hours at low rpm. 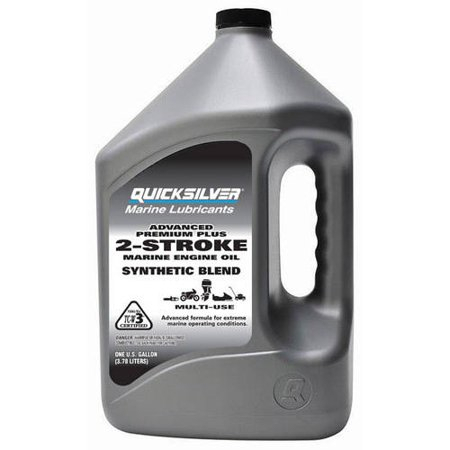 So when concerned about stressing a stone-cold engine, bring it up to its normal operating temperature while idling out of the harbor through the no-wake zone. If your marine engine is out of tune and won't run right until it's warm, then tune it up and enjoy the added benefits of better fuel economy and reduced emissions at all speeds.